So you may already have read here about the decision to showcase our makes from the Yorkshire Spoolettes meet up a few weeks ago, arranged by Ali. I wrote about it here .Sadly, I had gone early to collect BM (Blog Manager) from work, when in the pub, they all decided to blog post whatever we had bought! 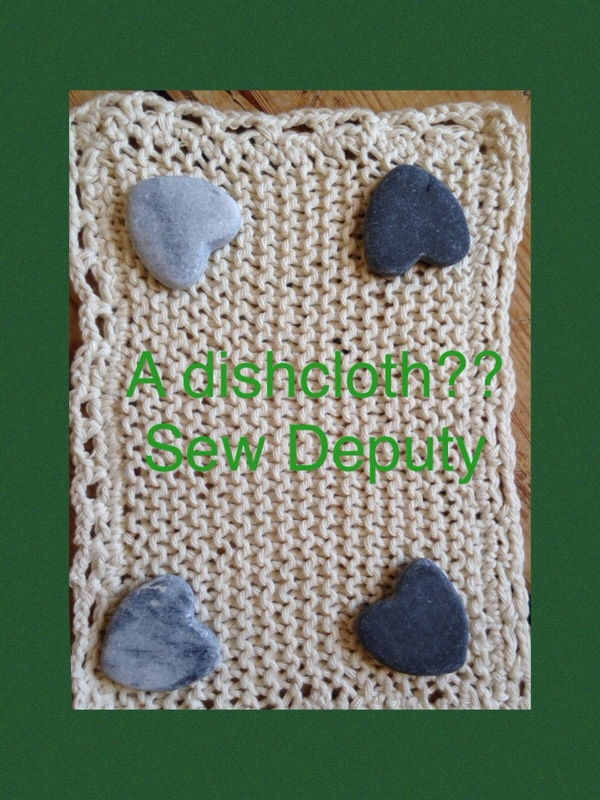 I laughed and laughed when I found out as I had bought a £2.00 ball of dishcloth cotton!! 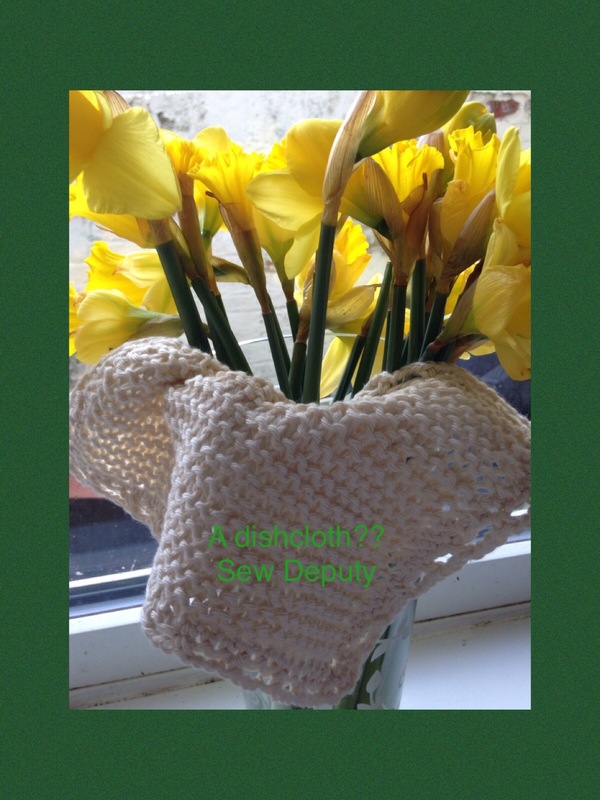 A colleague at school has just bought their first home so I thought a knitted dishcloth would be a good handmade gift…..they are the best dishcloths to own I think! So BM and I had a think about what I could make instead of a dishcloth! This made us laugh and laugh! Perhaps not! I decided to stick with the original plan, and the dishcloth was made (actually I made 4!! )but knew it was going to be worthy of it’s own blog post! So as well as knitting, it had a pretty crotcheted edge too. Here they are ready to distribute. It was half term for us this week and also my birthday. Here is a coaster I got as a gift……very true! 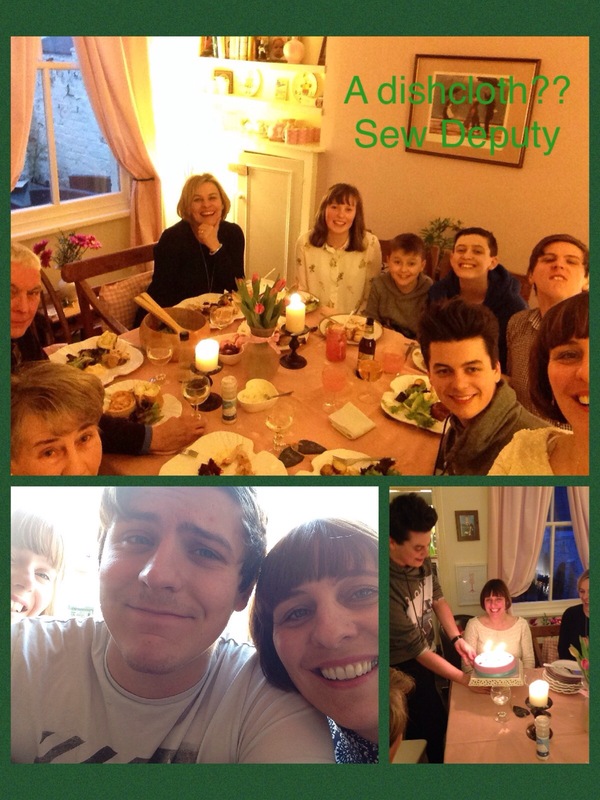 I had a lovely birthday with my family. 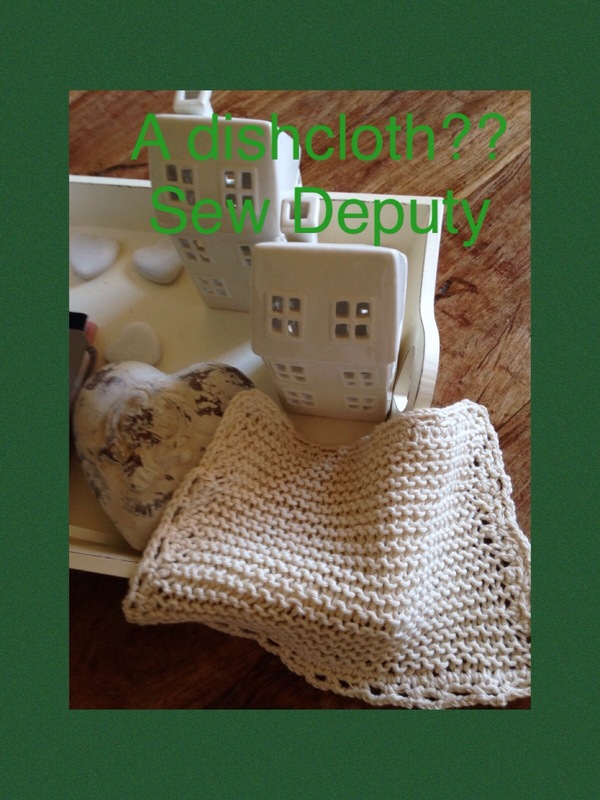 This is the end of the dishcloth post!! Wonky Factor : 10/10 how can a dishcloth post not score the ultimate? I’ve had some cotton in my stash to make one of those net shopping bags for years. 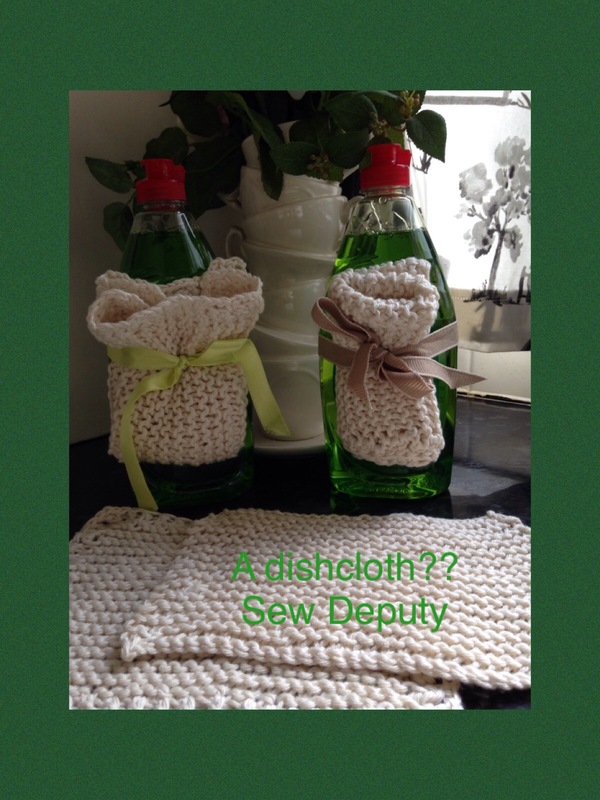 I never did never even thought of making a dishcloth, but that’s such a great idea! I have got repeat orders! You need to make yourself one! Great post! I love your dishcloths but am still a little disappointed you didn’t go for the crocheted swimsuit!! Hahahaha!! I did think of making a Barbie one!?! Would that have counted? 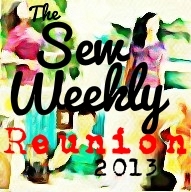 Maybe we should all sew one for the next meet up!?!? It could be at a Spa instead!?! I sent my auntie one and she said it was too posh to use!! Ha! I haven’t made a dishcloth since I was a teenager… These are beautiful! Thanks for all the details! Have been looking around on-line for cotton yarns as am not certain where there’s any locally, besides the big box stores (US phrase for Walmart & Target sort of stores). When you say “knitted” do you mean knit, purl, knit, purl? Or knit a row, purl a row? So Sorry! Am a very basic knitter, and not much of that, so I forget what’s what. Lol! Yes, we can chat whenever you’ve time! Just knit a row , knit a row and carry on. Perfect for first time knitters! Aye! Yes, very good for beginning knitters, and lazy ones like me. Lol! Love it. Have made some for myself before and they are amazing! But I made some in yello, turquoise and green so although they were fun colours to use in the kitchen, when they stained, I couldn’t bleach them clean. White/cream is a much better idea! Also it might be a nice thought to make scrubbies for washing in the shower – they are supposed to be good for (exfoliation, dahling!) I’ve seen it on Pinterest, so it must be true! Back to school tomorrow – hope you have a good half term. Only 5 weeks until Easter hols – yay!! 4 weeks and 4 days!!!!! 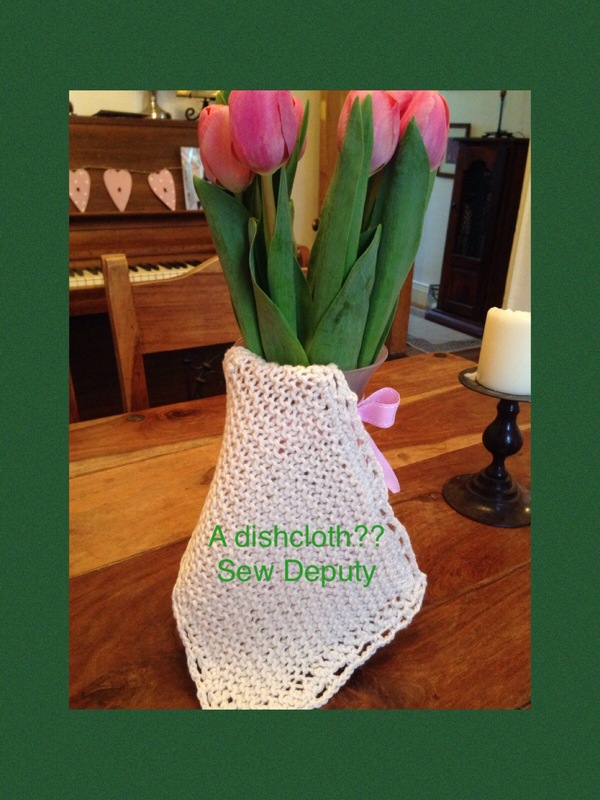 I’ve just started knitting my own dishcloths – very satisfying! The crochet edge on yours is a great idea. Yes, let’s start a dishcloth revolution! Our ancestors can’t have been wrong!! Absolutely! I’m not a great knitter but making these gives me a chance to experiment with different stitches and it doesn’t matter if they don’t come out quite right! Good plan!! Do you just use normal cotton in the different colours then? Mine was called craft cotton, is that different?